Continuing in the series of writings on the French Riviera – a one night stand in Nice, a town which isn’t so nice. 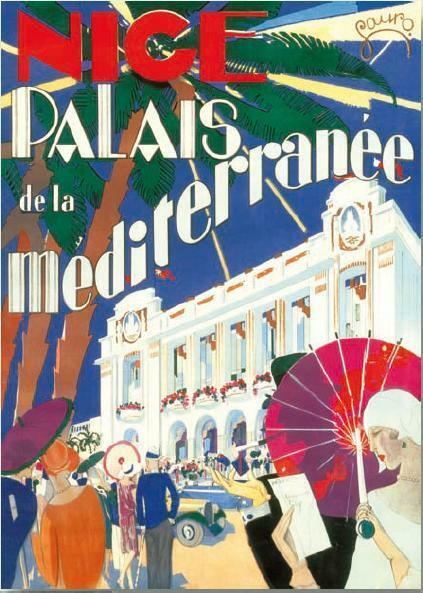 Tell anyone you’re going to Nice and … well ,this is the French Riviera, the Côte d’Azur, this is as good as it gets. Mixing with high society on the shores of the Med. Nice is sittade in the Baie des Anges (the bay of Angels) paradisiac, even aphrodisiac – just the kind of place where Aphrodite herself could have come ashore from her shell – though she wouldn’t have set foot on white, sun-kissed sands – rather she’d have hobbled across a stoney beach and would probably have stubbed a few toes, providing of course she had managed to negotiate the hundreds of bodies all frying in the sun. Well i, Nice you want to stay on the beach, the sea is pretty grey and you are never sure just how many condoms, syringes, turds and food wrappers are going to wash past you. Sorry to shatter your illusions. It’s just gone 7pm, and after a hard day’s driving from our provincial backwater, we have just hit the Promenade des Anglais in Nice. Six lanes of traffic mayhem. A palm tree punctuated “motorway” that follows the curve of the “baie des anges”. Few of my fellow road users are especially angelic though. This is a seaside racetrack for would be Grand Prix drivers who missed out on Monaco. No rules of the road around here. Accelerate on orange, drive through on red and watch out for pedestrians – blonde roller bladers, tanned torso joggers and blue rinsed geriatric poodle walkers, who cross the highway with a relaxed, death defying nonchalance, weaving their way between the long lines of gas-guzzling dream machines. 730pm – we’ve ground to a halt. Hemmed in by Ferraris, Lamborghinis, Aston Martins – packed full of air conditioned Mae West lipped whores and dandy drug dealers running their well manicured hands through their carefully coiffed footballer hairdos. Our battered green family hatchback draws disdainful looks from the cabriolet clique. So what if our car lacks class and air con??!! My better half unbuckles her seat belts then unfolds herself lithe and contortionist like and stretches over into the back seat. She pushes the blue plastic washing-up bowl and the pink toilet paper well down out of public view and then covers them with our cheap tartan travelling rug. No class? We’re just not in the same class as our fellow road users, anyway, were only in Nice one night, tomorrow we’re taking the ferry to Corsica. Despite the hype, Nice is a “ferry” town – like Calais, like Cherbourg like Dover – though the palm trees and the sunshine make all the difference. Away from the seafront, behind the crumbling charms of the Promenade des Anglais, Nice is all dirt and decay, urban sprawl as far as the eye can see. A down at heel down town, a succession of “rent by the hour” cheap hotels, fast food joints and mountains of rubbish. This is Soho in the seventies, rank, sad, dingy and living on the glory of bygone days. English Edwardian aristocrats heading south for a summer under the palms, the Mediterranean “douceur de vivre” and beautiful, brunette, cherry lipped, passionate, French mademoiselles who will never simply lie back and think of England, in the hope that they don’t have to think more than a few minutes. There are still those symbols of former times, The Hotel Negresco – pink domed palace of pre –war, pre-jet set opulence, now flanked by a MacDonald’s burger restaurant and a mobile phone shop. The Negresco still provide a touch of class in a world where modern millionaires have none. 8.30pm – out of the madness, behind the Promenade des Anglais on the Avenue de la Californie – where we are looking for our hotel – driving along at kerb crawling speed, prostitutes along the pavement begin to approach our car, whilst behind us, irate motorists (or perhaps real kerb crawlers) honk their car horns in over zealous annoyance. We get a few one-fingered salutes as the locals overtake our car. Finally, though, “up ahead in the distance, we see a shimmering light” – we have to stop for the night, I’ve been 12 hours behind the wheel. On either side of the hotel, a tattoo parlour and a kebab restaurant. Across the street, a hospital – hope we don’t end up there. I can only describe the hotel and the street as looking like mid-eighties downtown Beirut. So, we arrive bag and baggage in the lobby. An XXXL, gum-chewing receptionist welcomes us with a grunt and throws a set of keys at us. Guess she must have failed charm school and I’m actually wondering if she isn’t the hotel security guard rather than the receptionist. And so we bundle ourselves into the hotel lift – smaller than a phone box, it has obviously been designed for anorexics, even though a plaque inside the mirrored cell claims that it can take up to 500 kilos of human body (that’s roughly equivalent to four good sized rugby players) – fit four rugby players in this lift and they’d probably all suffocate before they reached the second floor. Room 612 at last – though it might as well be room 101 – the rooms at the hospital across the street are probably better. It’s a non-smoking room that stinks of that very distinctive Gauloises cigarette smoke. There are “unexplained” stains on the carpet, the curtains and on the mattresses (must be coffee, though its very crunchy) – blue mould around the bath and the shower, not unlike the streaks of mould that you get in Roquefort cheese. Finally, the air conditioning (it’s hot out tonight) -) a vast ceiling-mounted unit that churns and rattles like 60 a day asthmatic coughing up his last. In true British style, we decide not to complain – it’s only a one-night stand, we just won’t come back again. 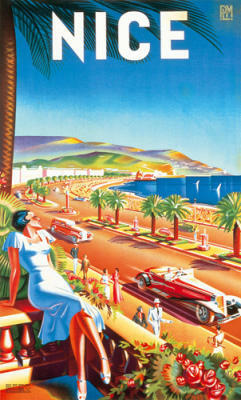 Posted in TRAVEL and tagged French Riviera, holidays, Nice, Riviera. Bookmark the permalink.